I love homemade bread because I like the fresh smell when the hot bread is just taken out of the oven. It’s so soft and tasty. I love it even more when it looks like the adorable piglet face in the above photo. It looks so cheerful. I can’t help smiling when I look at it. It’s very easy to make. Just do some little tricks on the dough and you can impress your family with this cute piglet face bread. I am sure everyone will love it. Let’s try it! Mix the ingredients except the egg yolk to make the dough, cover it with wet paper towels and rest for 15 minutes. When it’s done, roll the dough flat into a thin sheet and use a cup to cut out round shaped buns. Make a small triangular cut on the buns and brush some egg yolk on them. Flip the two sides of the triangular cut to form the ears of the piglet. Make a small round dough and place on the buns. 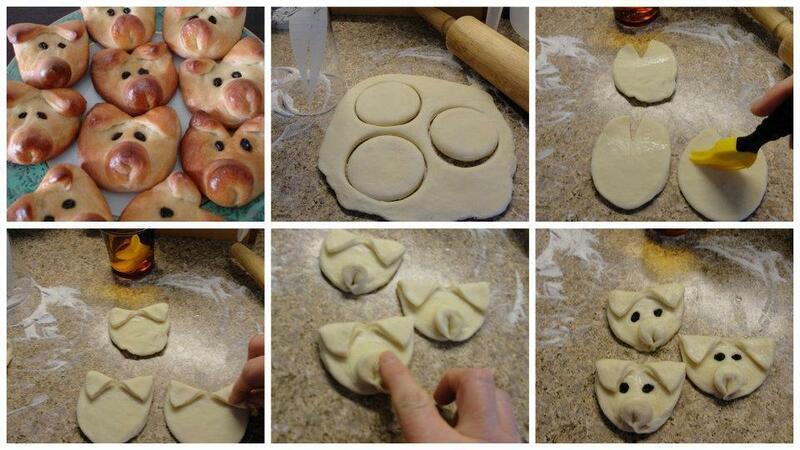 Press the middle of the dough with your finger to make the nose of the piglet. Use raisins or black beans for the eyes of the piglet. Let the dough rise until about double in size. Preheat the oven and bake for about 20 minutes at 400 degrees F or until golden brown.